In this engaging retelling of the story of the first Thanksgiving, the whimsical verse of Dandi Daley Mackall can now be heard on a read-along CD. 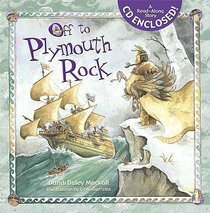 In "Off to Plymouth Rock, children will love to hear the story of the Pilgrims? voyage to the New World and the Native Americans? guidance that culminated in the first Thanksgiving. Illustrator Gene Barretta's warm harvest tones and lively characters add the perfect touch to this story of discovery, compassion, and faith. Educational and entertaining, this picture book will give children a unique view of one of the most amazing stories in our country's history. - Publisher In this engaging retelling of the story of the first Thanksgiving, Mackall's whimsical verse can now be heard on a read-along CD. Children can listen to the story of the Pilgrims' voyage to the New World and the Native Americans' guidance that culminated in the first Thanksgiving. Full color. About "Off to Plymouth Rock! (With Cd)"
In this engaging retelling of the story of the first Thanksgiving, Mackall's whimsical verse can now be heard on a read-along CD. Children can listen to the story of the Pilgrims' voyage to the New World and the Native Americans' guidance that culminated in the first Thanksgiving. Full color.